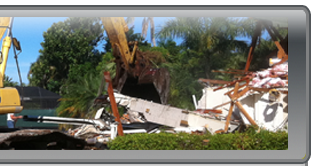 FORT MYERS, Fla. (Feb 21, 2007) - It took demolition crews just 55 minutes at sunrise Tuesday to send the roof of historic Exhibition Hall crashing to the ground. The Fort Myers' meeting place for half a century, turned condemned riverfront eyesore, is history. Two trackhoes from Honc Destruction of Cape Coral began ripping away huge swaths of roofing at 7:42 a.m., sending wood splinters into the air along with tin and the tattered cloth tarps left from hurricanes Charley and Wilma. The building, the city's first meeting place when it opened in 1954, hosted Elvis Presley, a campaign stop by Gerald Ford and a comedy routine by Milton Berle as well as countless school dances, pageants and events. Efforts to save it as historically significant failed. The city has scheduled a public hearing from 6 to 8 p.m. March 12 at the Hall's modern equivalent, Harborside Event Center across the street. There, the public can comment on what should replace the relic on the city's downtown riverfront -- preliminary plans call for increased greenspace, a retail shop and perhaps a restaurant. With sunrise dappling the Caloosahatchee River, the hall's demolition moved quickly as workers used fire hoses to spray away dust rising in the crisp morning air. By 8:37 a.m., the hall's roof was history, and Honc owner David Mulicka's goal for the day was finished. "Down is one thing. Gone is the second phase," said Mulicka, whose family-owned business won the $141,588 contract to remove the hall. He has 30 days to complete the work. Debris will be sorted into wood, concrete and metal and hauled to appropriate landfills. The hall's demolition was not on Councilman Levon Simms' mind, but he heard the racket while out for his morning run and stopped to watch. "It's good to see it going down -- it will give the city another place to work," said Simms of rejuvenating the site, seen as one of the cornerstones of downtown revitalization. Simms, who retired as a school teacher after 35 years, has been to too many hall functions to count. "We used to give the senior tests here," he said. Although bleachers had been erected across the street in the Harborside parking lot, only a handful of people turned out to watch the hall fade into history. "I like historic things - it's a shame they are going to knock it down," said Lou Rivera, 57 of Fort Myers, who never attended an event there but was intrigued Elvis hit the hall's stage. "We can't go all to the future. We have to leave something for our kids to remember," Rivera said. "I imagine back in its time it was a pretty wild place." Jeff Ocasio, 48, a North Fort Myers resident and downtown mortgage broker, went to a book sale there before Charley - "way before Charley," he said. "It's kind of sad, but it's progress," Ocasio said. "You got to move on." Dave Tarrant, 71, of Illinois, climbed from his sailboat at the yacht basin to watch the hall come down. He remembers the building's more glamourous youth. "It was an impressive building," Tarrant said. ""But its time has come. Hopefully they will put something up that's fully accessible and useful to the public." • 7:42 a.m.: Two trackhoes begin ripping large sections of roof. • 7:47 a.m.: The machines work down the roof and begin dragging away sections of concrete wall. • 8 a.m.: The wood arches holding the roof fall inward and one of the trackhoes burrows inside the building. • 8:18 a.m.: The eastern half of the roof crashes to the ground. • 8:30 a.m.: A trackhoe rips away the remaining section of the southeast entrance and the east end of the building. • 8:37 a.m.: The remainder of the roof is ripped off the building. Serving Southwest Florida, Lee County, Charlotte County, Collier County, Cape Coral, Fort Myers, Pine Island, North Fort Myers, Sanibel, Captiva, Punta Gorda, Port Charlotte, Bonita Springs, Estero, Naples, Marco Island. 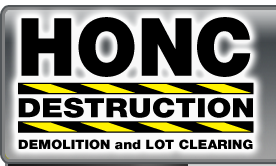 Â© Copyright 2017 Honc Marine Services Inc., 1130-1 Pondella Road, Cape Coral, FL 33909. All Rights Reserved. CGC1505402. Website Design By Total Concept, Inc.